Some big news in educational economics came out this week with a team of economists including Raj Chetty and Emmanuel Saez releasing some pretty groundbreaking results on the long-term impacts of Tennessee's Project Star. Slides from the talk where the results were presented are here. The New York Times has a pretty good overview here. Project Star is pretty well known in economics as it was one of the first big purposely randomized education experiments. Students were randomly placed in classes with different numbers of students to try and tease out whether class size had an effect on educational outcomes ("Star" pithily stands for "Student Teach Achievement Ratio"). It famously found that (a) effects were there in the intuitive sense, i.e., students in smaller classes did better on standardized exams, the metric of choice, but (b) those effects trailed off over time. What Chetty, Saez and their coauthors do (which I think captures pretty nicely the sort of economics that sends a tingle of cleverness-excitement up my spine) is match students who were in the Star experiment with their tax records to get long term earning data. Two things are particularly cool about this. The first are the results themselves. They find that not only are class size effects important in the long run but teacher quality effects and (even more robustly) class quality effects have very measurable long-term impacts on latter life earnings and college attainment / achievement rates, even when those effects take place in kindergarten. If you want the terrifyingly strong result, check out slides 44 and 49 in the pdf. Moreover, they go back and show that test scores, which everyone agrees are only a proxy for what we actually care about, do a fairly nice job of predicting how people will do later on, providing some validity to programs that measure their impact by how well students do on exams. Whether that should be exciting or troubling is, I think, a pretty deep question. The second thing that's cool about it is that it sets out to find long-term, indirect, but ultimately very important effects in a very picked-over area of research (Star has been written about a *lot*). The education literature has long been one of the main sources of new applied econometric technique, which is why someone like me whose research has very little to do with education knows about things like Tennessee Star or class size cutoffs in Israel. So the precedent this sets, which is basically "sometimes the effects we care about are 20 years down the line and not in the original area we were looking at" comes in a heavily trafficked area of research with both rich existing precedent and a lot of sway over other areas of applied research. Which obviously makes me happy, since that same precedent can be thought of as applying to a lot of the environmental, health, and public goods questions that we concern ourselves with in sustainable development-related research. Anyway, if you have a second read the Times article or, even better, flip through the slides (they're pretty clean and approachable and have some great graphs). Then go teach a five year old something new. Physics Today has a nice article this month on the history, development and contributions of the "A-train," a formation of satellites that orbit the planet and help us observe the climate system. For non-experts, its a gentle and interesting introduction to many of the challenges associated with trying to observe and characterize the state of something as large and dynamic as, well... the entire world. Without satellites, what we know about climate dynamics would be limited to what we can observe from the ground, balloons and airplanes. While detailed measurements from the surface are essential to the science, they are expensive to collect and cannot tell us what is happening in locations far away. Satellites, on the other hand, allow us to observe many locations rapidly at a cost that is lower than it would be if we tried to make all of those measurements from the ground. The revolution that satellites offered us, in terms of understanding the dynamics of the planet we inhabit is often under-appreciated. One might think that humans, inhabiting so many locations around the world, would somehow possess a single collective record of the daily temperature and daily rainfall everywhere. After all, how difficult is it to step outside with a thermometer and read it? Or to leave a bucket outside and check every day how much water fell into it? It isn't terribly hard, but without the right institutional structure to provide funding, incentives to the observers and safe repositories for the data, it doesn't happen consistently. A quick look at current weather stations in Central Africa compared to the Eastern Unite States compared to the Central Pacific confirms that our ground observations around the world are not of uniform density (or quality). Here's an example of the challenges we face. 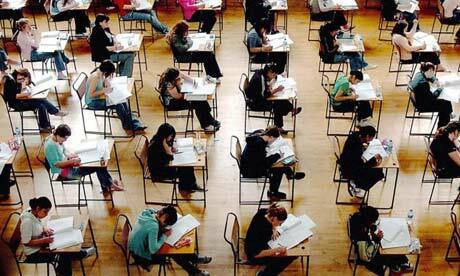 I study how changes in the environment, particularly the atmosphere, influence societies. One question I've looked at is whether rainfall matters to the economies of the Caribbean and Central America. To answer this question, what I'd like to do is to compare how economic outcomes (like profits in agriculture) respond to changes in rainfall. 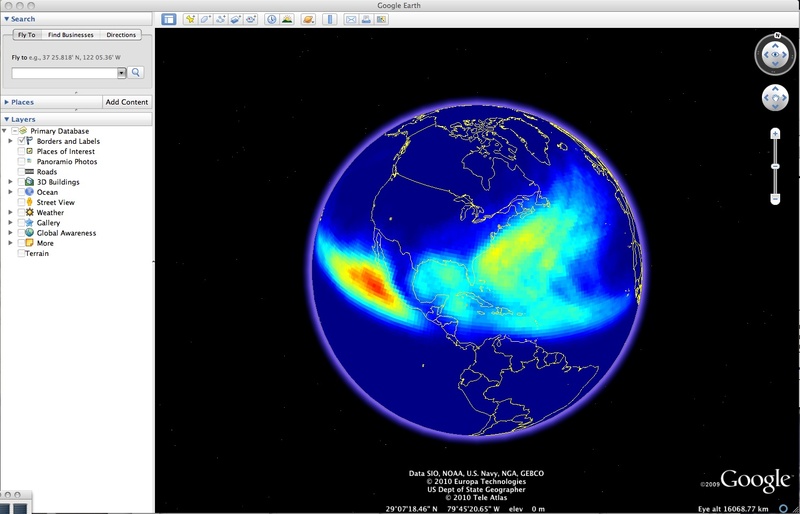 To do this, I tried to look at annual average rainfall over different countries over time. But it turns out that getting this kind of data isn't trivial. There are thirty-one countries south of Mexico and north of Colombia (each one is given a number on the y-axis in the figure at right). But only about half of those countries regularly collected any rainfall data between 1950-1980. In the figure, an open blue circle indicates that the country listed on the y-axis has at least one continuous record of rainfall for that year. Not too many countries satisfy this criteria. If I'm willing to work with data that's been processed a bit more, I could access statistically interpolated data that tries to use the existing station data to estimate rainfall in nearby countries. Countries with complete records of interpolated data are given orange dots in the figure. Notice that there's more estimated rainfall data, especially before the eighties when enough stations were collecting data to make useful estimates for the countries between stations. But what happened between 1980 and 2000? Why did the stations stop collecting data? 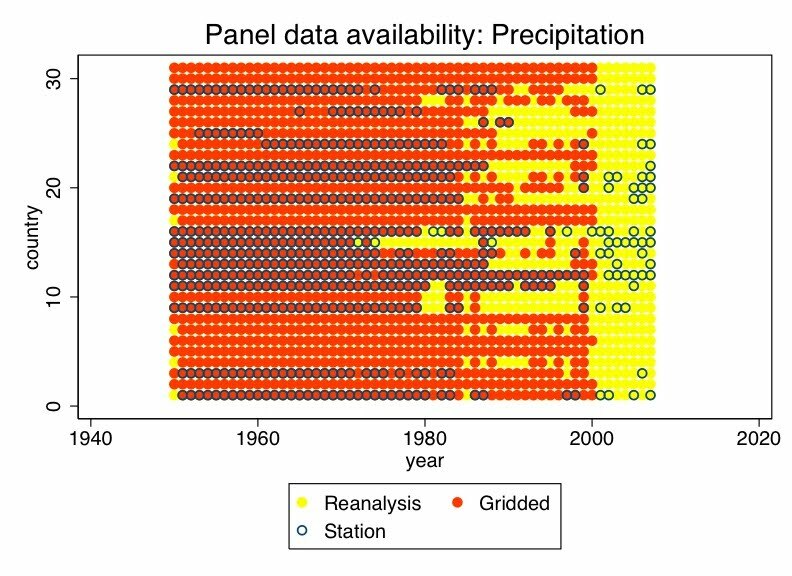 And even worse, once enough stations stopped recording rainfall, the interpolated estimates become garbage, so the orange dots start to disappear too (note: the orange data stop in 2000 because of the data set, not because of data availability). It would take a fair amount of detective work to figure out exactly why specific observations were missing, but a lot of social and political changes that might have contributed to the data scarcity were occurring in the 80's and 90's. For example, many of the countries in the region gained independence from European colonizers during that period. If new young governments were less worried about maintaining unbroken records of rainfall than older colonial governments (which is often the case, and sometimes for good reason) than this could contribute to the breakdown of our station records. Luckily, the early eighties were also the period when satellites first began taking regular observations of the atmosphere. And while satellite observations are never identical to surface observations, they are (1) often good enough and (2) always better than nothing. 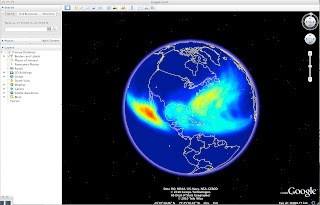 Making the best of what we have, gauge data, satellite data and numerical simulations can be combined to create longer, continuous and more consistent records of the environment. 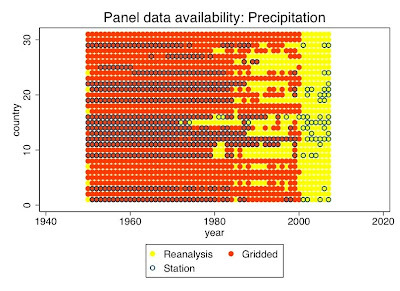 The yellow dots above indicate that estimates of rainfall can be constructed using this combination of data sources. We certainly don't know everything about these planetary scale systems, but sometimes its worth reflecting on the fact that we know anything at all. Personally, I can't decide whether its more remarkable that someone organizes thousands of scientists around the world so that they all leave buckets outside to measure rainfall or that someone realized thirty years ago that thirty years later we would be so grateful to them for launching machines into space and leaving them there just watching for the weather. The IPCC Scholarship Programme has been established with the funds received from the 2007 Nobel Peace Prize award to the IPCC. The first funding partner of the Programme is Dr. Gro Harlem Brundtland, Former Norwegian Prime Minister and UN Special Envoy on Climate Change. This seems like a sensible, ethical use of the award and a step in the right direction. For many years I have argued that the technical knowledge needed to assess the costs or benefits of climate change (and related policies) are in short supply for many of the countries that need the expertise the most. Colleagues who attended various international climate negotiations also consistently comment that the absence of technical experts, particularly in poorer (probably more vulnerable) countries negatively (and strongly) affects the bargaining power of many countries. Even in the United States, it seems difficult to obtain the technical know-how necessary to formulate informed, comprehensive climate policies. Perhaps other wealthy individuals/organizations will follow the lead of the IPCC and support the development of this kind of human capital. Today, the publishers of Nature announced that they will begin publishing a new journal titled "Nature Climate Change". Launching in April 2011, Nature Climate Change will be a monthly journal providing in-depth coverage of the impacts and wider implications of the Earth's changing climate. A multidisciplinary journal, Nature Climate Change will publish high-quality research across both the natural and social sciences. The journal's mission will be to unify the body of research on the understanding, and impacts, of climate change as well as to place it in a wider social and political context. This is extremely useful for those of us who are trying to work on climate change related problems but use a variety of methods from different disciplines. Nature Climate Change will be a focal publication for the research community and for other parties interested in the implications of global and regional climate change, including natural and social scientists, policy makers, economists, governments and all other researchers on the periphery of climate change research. I received this catalog in the mail and was surprised by the number and breadth of academic books on sustainability issues. Several well known authors and many interesting topics. I cannot vouch for the quality, but I will certainly browse the catalog and thought it was worth sharing. The complete list of catalogs is here. I've added it to the Meta-Resources page. Abstract: While the effects of rising mean temperatures on agricultural output have been studied extensively, there is limited discussion of the impact of inter-annual weather variation on crop yields. This paper estimates the link between weather and crop yields separating the influence of (i) mean weather outcomes (i.e., climate) to which a farmer can adapt from (ii) unpredictable year-to-year weather fluctuations to which a farmer can only partially adapt as crops are planted before the weather shock is realized. We find that corn in extreme climates, both hot and cold, are more sensitive to inter-annual weather variation than the ones in moderate climates. Global warming has two effects on corn yields: First, warming will induce farmers in moderate-temperate climates to plant varieties that are less robust to weather fluctuations, while farmers in cool climates will plant varieties that are more robust to weather fluctuations. Second, the elasticity of reductions in expected corn yields with respect to an increase in the standard deviation of weather fluctuations is -0.4. Since most farmers are eligible for subsidized crop insurance, an increase in weather variation also directly translates into added government payments. Comments: One of this paper's nicest aspects is that it explicitly looks for the "micro" structure underlying aggregate production curves. We often assume there is a sequence of production functions for several crops, each of which has a different peak point along some dimension (here, temperature). [For an example of this assumed structure, see the discussion in Deschenes and Greenston (AER, 2007); their working paper is here.] The usual assumption is that farmers who adapt to climate changes produce along the upper envelope of several overlapping production curves and are therefore less vulnerable to long term changes in temperature than they are to short term fluctuations. This paper tries to test this assumption explicitly and finds that it holds up. The other findings of the paper are nice, but to me, this seems like the most important contribution. Climate change is expected to alter the spatial pattern, frequency, and severity of extreme weather events. These events will likely catalyze individuals‘ migration decisions as a means to reduce both direct and indirect weather-related risks to economic livelihood, life, and health. We analyze historical patterns of migration among U.S. counties in relation to varying spatial and temporal patterns in tornado activity and as a function of variables intended to capture the evolution of perceptions of these tornado risks. Our results provide an opportunity to understand migration based on extreme weather data that cover a long time-period, have a nationwide spatial extent, and include important economic factors that may constrain or enhance individuals‘ abilities to mitigate economic and health risks via migration. The broader goal of this research is to improve our understanding of how different types of households adapt to changing natural hazards. In particular, we are interested in the distributional consequences of climate change impacts of this type. Comments: The data assimilation involved with this paper is impressive, so I bet they will produce more work using these tornadoes as instruments. The results are clean and somewhat larger than I would have expected. However, I think the title and interpretation may not be appropriate, since it was not clear that they ever tested for impacts associated with the risk of events occurring, only the events themselves. Abstract: A critical issue in climate-change economics is the specification of the so-called "damages function" and its interaction with the unknown uncertainty of catastrophic outcomes. This paper asks how much we might be misled by our economic assessment of climate change when we employ a conventional quadratic damages function and/or a thin-tailed probability distribution for extreme temperatures. The paper gives some numerical examples of the indirect value of various GHG concentration targets as insurance against catastrophic climate-change temperatures and damages. These numerical examples suggest that we might be underestimating considerably the welfare losses from uncertainty by using a quadratic damages function and/or a thin-tailed temperature distribution. In these examples, the primary reason for keeping GHG levels down is to insure against high-temperature catastrophic climate risks. Comments: I think this is the most constructive of Weitzman's string of papers on catastrophic risk, perhaps because the final result (which is actually the absence of a result) doesn't rest on infinite negative losses. I was most struck by his case that the quadratic loss function assumed by Nordhaus et al. is insufficiently flexible to express large aversions to catastrophic events. I think this is an example of a seemingly innocuous, esoteric assumption made twenty years ago coming back to bite us later. Abstract: We study the consequences of poverty alleviation programs for environmental degradation in Mexico. We exploit the community-level eligibility discontinuity for Oportunidades (a conditional cash transfer program) to identify the impacts of income increases on local deforestation, and use random variation in the initial program phase to explore household responses. We find that additional income significantly increases demand for resource-intensive consumption goods. The corresponding production response increases deforestation but is localized only where communities have poor road infrastructure. The results suggest that better access to markets simply disperses environmental harm; the true impacts are only observable in infrastructure poor areas. Comments: I really like what this paper is trying to do, the data they are willing to integrate and the importance of the findings. It has all the makings of a great paper. My only concern is whether the absence of deforestation in communities with high road densities is robust. In general, its far harder to demonstrate a "null" result than to show that some sort of non-zero relationship exists, since failing to reject a null-hypothesis doesn't tell you much. I think that in order to make the claim described in the last two sentences of the abstract, they'll have to do substantially more work with the NDVI data they are using and/or look at data on trade or other markets. Abstract: Recent research indicates that monsoon rainfall became less frequent but more intense in India during the latter half of the Twentieth Century, thus increasing the risk of drought and flood damage to the country’s rice crop. Our statistical analysis of state-level Indian data confirms that drought and extreme rainfall negatively affected rice yield during 1966-2002. Using Monte Carlo simulation, we find that yield would have been 2% higher on average if monsoon characteristics, especially drought frequency, had not changed since 1960. Yield would have received an additional boost of nearly 5% if two other meteorological changes (warmer nights, lower surface radiation) had not occurred. Climate change has evidently already negatively affected India’s hundreds of millions of rice producers and consumers. Comments: I think their Monte Carlo method will become standard in the next few years. Its a nice way at getting at "climate" in comparison to "weather". Abstract: We identify two issues with a standard time series approach to reconstruction of past climate fluctuations from paleoclimatic data series, one related to specification of the estimated relationship between climate and the paleoclimatic index, the other to the methodology of estimation. We show that the standard approach provides biased estimates of the reconstructed climate series and underestimates the true variability of historical climate. We demonstrate that inversion of the estimated response function between tree ring growth and climate indicators provides consistent estimates of historical climate. The inversion method results in an overestimation of the variance. We show analytically as well as using Monte Carlo experiments and actual tree ring data, that use of the new specification and reconstruction procedure can be crucial for inferences about the nature of past climate and interpretation of recent climate variations. Comments: I think this paper is going to have a big impact. And I think the idea of having statisticians from different fields check one another's work is brilliant. I hope this is implemented more in the future and I hope economists invite non-economists to check their math, so the exchange is bidirectional. Abstract: In this paper we estimate the impacts of climate change on the allocation of time using econometric models that exploit plausibly exogenous variation in daily temperature over time within counties. We find large reductions in U.S. labor supply in industries with high exposure to climate and similarly large decreases in time allocated to outdoor leisure. We also find suggestive evidence of short-run adaptation through temporal substitutions and acclimatization. Given the industrial composition of the US, the net impacts on total employment are likely to be small, but significant changes in leisure time as well as large scale redistributions of income may be consequential. In developing countries, where the industrial base is more typically concentrated in climate-exposed industries and baseline temperatures are already warmer, employment impacts may be considerably larger. Comments: Clean, simple and intuitive. I think there will be more work in this direction. The only surprise is that in the twenty years since Schelling's armchair assessment, nobody thought of this.